Our 2017 Green Industry Benchmark Report showed that nearly 88% of businesses find it difficult to find good employees. Additionally, 7 out of 10 green industry businesses said they find their best applicants from word of mouth (employee referrals, customer referrals, friend/network referral). So, although referrals are the best source, they still aren’t providing enough applicants to quash the labor shortage affecting businesses. This means simply having an employee referral program won’t get the job done. Instead, an effective, engaging and purposeful program is needed to confront such a dilapidated labor market. A referral program is when you offer employees an incentive to refer a candidate from their own network of people for a job. Why should you have a referral program? There are plenty of reasons to start a referral program, but here are a few to consider. To begin, it expands your pool of applicants by turning your employees into recruiters. Additionally, hires from referrals are more likely to stay longer. And lastly, as your list narrows down, and you’re having trouble differentiating between applicants, you have employee(s) that can offer you key insights and instill some level of trust in the candidates they recommended. DISCLAIMER: Of course, as you might have noticed this can also lead to employees being bias - either blindly or intently - since they will benefit from their referral being hired. Your vision should be clear - knowing exactly what you want to get out the program. It might be more than simply getting an onslaught of referrals. You might want a more diverse set of applicants with a wide range of experiences, skills, backgrounds, etc. Your program’s incentive should work for both you and your employees. Start by asking yourself what a quality employee is worth to your green industry business. Also take into consideration the fact that a referral will speed up your hiring process, saving you time and money. You won’t have to post to a bunch of job boards or sift through a pile of applications. Next, you should start thinking about what incentive will motivate your team to take the time to refer someone. This means your reward should be something that - one - aligns with your budget and - two - causes employees to take action. One way of doing this is making it a two-part reward. 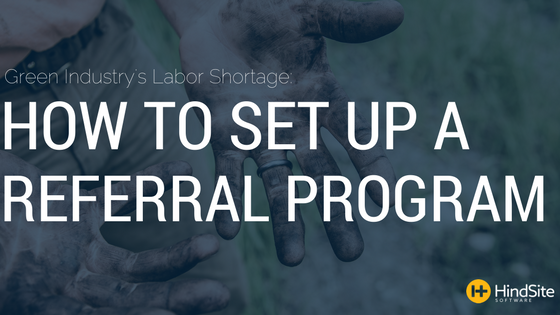 The first coming when you hire the referral then offering another reward when the hire stays for a certain amount of time. The easier it is to refer the more likely your program will be successful. Your employees shouldn’t have to jump through a bunch of hoops to recommend a candidate. The best-case scenario is that your team just has to provide you with a name and some sort of contact information. From there you (or whoever does the recruiting/hiring) should take over. Train: The first thing you have to do is train your team. They should know exactly what they need to do to use the program. Explain: Provide your employees with a brief outline of the type of candidates you're looking for. Recognize: Each time a team member refers an applicant give them a little recognition, this could be a simple shoutout at your morning meetings. Inclusive: One of the reasons many programs fizzle out is because employees feel like they get thrown out of the loop after they hand over a candidate. An employee's involvement doesn’t end there, rather it’s just the start. Keep them updated with the hiring process and, if you don’t choose their applicant, make sure you tell them and explain why you went a different direction. Referrals are one of the best sources for new hires. Creating a program and determining a reward that works for both you and your team is usually the easy part. The tough part is encouraging participation and - even more - maintaining involvement as your program continues, hire after hire, referral after referral.